This sounds like it could be a lot of fun. Enjoy a regal banquet and an exciting array of live entertainment by flickering torch light in the vaulted cellars of Ivory House, just minutes from the Tower of London and Tower Bridge. Join King Henry VIII and his special guests who will perform a show of festive pageantry that includes duelling knights, incredible magic and feats of strength. 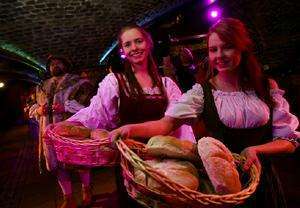 Unlimited beer and wine will be served during your meal by wenches and after the four-course banquet and show, there is music and dancing until late. Warwick Castle do similar events, if London is too far for an evening. Remember that if you travel in by train you can always get this on 2 for 1 for £49.95 all year round. Went to one of these in London about 10 years ago. Was a great laugh, but we also had quite a few of us go which made it even more enjoyable. however it did state when going though quidco "Using any voucher/discount code not provided by Quidco will cause your cashback to be declined" so it may not go through but worth a try! Went for this and quidco tracked @ 10% - £5.20however it did state when … Went for this and quidco tracked @ 10% - £5.20however it did state when going though quidco "Using any voucher/discount code not provided by Quidco will cause your cashback to be declined" so it may not go through but worth a try! You should get it and fast, I had mine paid within two weeks last time I used voucher codes on there. I've been wanting to go to this for ages. Heat! You should get it and fast, I had mine paid within two weeks last time I … You should get it and fast, I had mine paid within two weeks last time I used voucher codes on there.